The other day I was going through my monthly business credit card statement and noticed how many monthly subscriptions I have for online blogging tools. I remember when I first started four years ago, it was hard to know which ones to invest in. There are so many awesome choices and new tools are constantly popping up and causing shiny new object syndrome. Whether you’re just starting out or you’ve been doing this as long as I have, keeping costs down is always a concern. After all, we’re here to run a profitable business right?! I’ve compiled a list of my favorite blogging tools for under $30 a month to help you make smart financial decisions in your business. G Suite is a cloud-based productivity suite that includes Gmail for professional email, Drive for online storage, Hangouts for video meetings, Calendar for scheduling and Docs for editing files. In short, you get to use all of the Google Apps you’re used to but with your domain email address youname @ yourdomain.com. First of all, if you want to treat your blog as a business, it’s super important to act like a business. You’ll never email Target using target @ gmail.com right? Plus, G Suite comes with all of the apps you’re already familiar with and 15GB of free storage. I keep my entire business life organized in Google Drive. I use it to share files with my assistant and much more. Learn how to set G Suite up: How to Start a Blog in 20 Minutes — I promise it’s not scary! An online appointment scheduler that syncs with your calendar. Oh let me count the ways! Acuity has made my life so.much.better! I can’t believe we never used something like this in corporate. Acuity allows you to set different meeting types for appointments. You can set parameters for each meeting for availability, duration of the call, time between calls, and you can even have people pay you before they are able to book a meeting with you. I sync my Acuity calendar with my Google Calendar so appointment times are automatically blocked when I put something on my calendar. You can also color code your appointments so you have a quick snapshot of what your day/week/month looks like by appointment type. Acuity integrates with many different platforms. My two favorites are ConvertKit and Zoom. Acuity automatically adds new people to my email list and sends out a video chat link for Zoom. I use Acuity to set up coffee chats, strategy calls, exploratory calls, recurring meetings with clients, and so much more! Watch my free Acuity Scheduling Tutorial: How I Use Acuity Scheduling to Save a Ton of Time! Make sure to subscribe to my YouTube Channel for more awesome tutorials! Canva is a free, web-based program, for graphic design. It replaces Photoshop for people who simply don’t want to learn the technical aspect of creating graphics. Canva provides templates, graphics, icons, and so much more. Canva for Work is the paid version of the program. I use Canva for Work because it allows me to preload my fonts, colors, download transparent files, use the magic resize feature, and sort my designs in folders. I’d recommend signing up for the free version first and once you are comfortable with the program then I’d consider signing up for the paid version. Watch my free Canva tutorial: How to Create a Call to Action Button in Canva for Free! Zoom is an online video conferencing tool. As a blogger, you may be wondering why on earth you need a video conferencing tool. Trust me, you do! It’s hard to form real connections with other people online through text. Video conferencing allows you to grow and deepen friendships online. Many bloggers use Zoom to host webinars or Q&A sessions for their audiences or host mini-mastermind groups with other bloggers. I love Zoom because I can interact face to face with multiple people at the same time and easily share my screen. The best part…you can record your sessions and Zoom even offers cloud storage! Zoom recently came out with an amazing new feature that enables you to stream live on Facebook and YouTube. If live video is a core strategy of yours, this is a game-changer! An eCommerce platform that enables you to sell digital products online. There is no doubt that the number one way to scale your income as a blogger is through selling your own products. Selling digital products is a cost-effective way to bring your ideas to market. SendOwl provides a platform for customers to checkout and download your digital products. It connects with PayPal and Stripe. It integrates with numerous email service providers, including the one I use, ConvertKit. There are two main reasons I love SendOwl. First, it offers an amazing affiliate program that is easy to set up and manage. An affiliate program allows you to pay commissions to people who promote your products and is a great way to get more people sharing what you are selling. Second, it’s easy to set up coupon codes and run special promotions for your products. Tailwind is a Pinterest-approved scheduler. It enables Pinterest users to schedule out their Pinterest content in advance. Pinterest is a must for all bloggers but it can quickly become overwhelming without a way to automate it. This is where Tailwind comes in. Tailwind not only allows you to automate your pins, it also provides valuable analytics and optimizes the times your pins go out so they get the best engagement. Psst… you can get two months of Tailwind for free by purchasing Pin Practical Masterclass! Sound a bit confusing? I know it can at first! I highly recommend checking out my 9-day Pinterest challenge to help you build your Pinterest presence. It’s called Pin Practical Accelerate and it shows you everything you need to know to get started with Pinterest. LeadPages is a lead generation tool. You can build beautiful opt-in pages, sales pages, thank you pages, and much more. I invested in LeadPages before anything else (even before I was making any money!). I knew that is was super important to my business to grow my email list but I wasn’t sure how to create opt-in pages that would convert. LeadPages also comes with a feature called LeadBoxes. ConvertKit is an email service provider (ESP). An ESP provides a server that houses your email list and sends out your mass email distributions. You need an ESP to ensure you are complying with CAN-SPAM laws. Oh let me count the ways! ConvertKit is a game-changer for your business. Email marketing should be the number one asset in your business. It’s the only form of communication you own for communicating with your audience. CoSchedule is an all-in-one content marketing calendar. CoSchedule is a new add-on to my blogger toolkit. I’ve been blogging for 4-years but always lacked a good organization system for my editorial calendar. CoSchedule has literally saved me hours of time! You can plan all of your content in one drag-and-drop calendar. You can plan blog posts, emails, promotional materials, social campaigns, and so much more. My favorite features are the checklists and social templates. I think the best way to show you the value of CoSchedule is to make a tutorial video. Check back, I’ll be recording it soon! Phew! 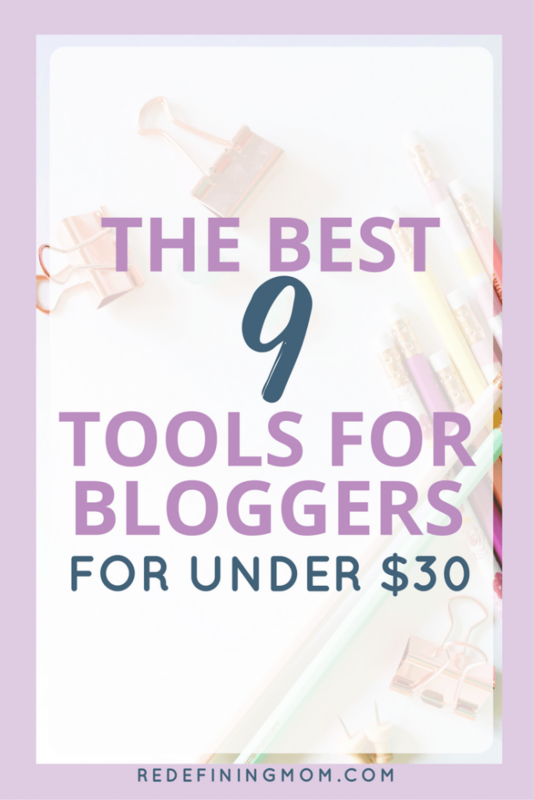 There you have it, my top 9 tools for bloggers that cost under $30! I bet you’re wondering how you will pay for all of these awesome tools. I’ve got you covered! Great list! Looking forward to the CoSchedule tutorial!!! I need the Coschedule tutorial! I used it for several months but really did not know what I was doing. So excited to learn more. Thanks Monica!